Open: Saturday-Sunday: 7 a.m.-2:15 p.m. It's not really a building, at least not like any building you're probably used to dining in. Like many of the semi-permanent structures at the Tohono O'odham Swap Meet, its purpose is simple—provide shade, trap the swamp cooling in and establish a home for whatever foods may be found inside. Half chickens roast on barbecues, al pastor turns on spits, pots of menudo bubble, real pico de gallo sits in plastic pouches and waits to be snatched up and snacked on by swap meet shoppers. All of this happens under functional roofs with optional walls. While it would be easy to spend the entire summer discovering all of the eats the swap meet has to offer, any exploration of the dusty little south side setup near Drexel Heights has to start somewhere and it's easy to dip a toe in, so to speak, at S. Antojitos Salvadoreños. Located on the outer perimeter of the open-air resale market and more, SAS is housed in one of the larger stands on site. Something like a comedor you'd find much further south of South Tucson, the décor is strictly utilitarian with plastic-topped chairs and tables, some covered in vinyl tablecloth. Now the digs might not be fancy, but the owners (I'm guessing it was most likely one of their teenage sons who work in the restaurant) are savvy. They have Square for credit cards, they're on Facebook, they're on Yelp—they're an easy search if you know where to look and something you could happily and unwittingly stumble upon while browsing for breakfast ideas, which opens them up to a new world of customers. Ordering at the counter, you'll get fast service from this family-run joint. The older sons run the counter, the younger bus tables and the even younger daughters wipe it all down and prepare for more guests. The ten-or-so tables stay pretty consistently full, but the efficiency of the crew keeps tops turning and people churning in and out. Two large vitroleros are displayed at the front—one holding jamaica, the other horchata. You can also get bottles of soda. Once at your table, you'll quickly be served chips, salsa and a slaw-like mix of pickled veggies that can be put on pretty much anything. The menu at SAS offers Salvadoran specialties like pupusas and fried plantains, but with some distinct Sonoran flare. The perfectly smooth refried pinto beans, the deep red chile colorado, the bright green chile costillas—all aren't traditional Salvadoran fare, but expand the menu with satisfying options. The chile colorado, in particular, is one to look out for, with a substantial, smoky and velvety base. Thick, handmade corn tortillas and chewy, yet crisp flour tortillas serve as the canvas for many of the plated dishes, like simple breakfasts of two eggs, beans and sweet fried plantains ($6). For something less simple, the stick-to-your-costillas combo of chicharrones and yuca frita ($7), served on a bed of cabbage, cucumbers and more to cut the fatty richness of the fried food on top, is a great dish to share. Of course, you can't eat at SAS without getting a pupusa or two or three, and at just $3 a pop, you'll likely be ordering more than one. 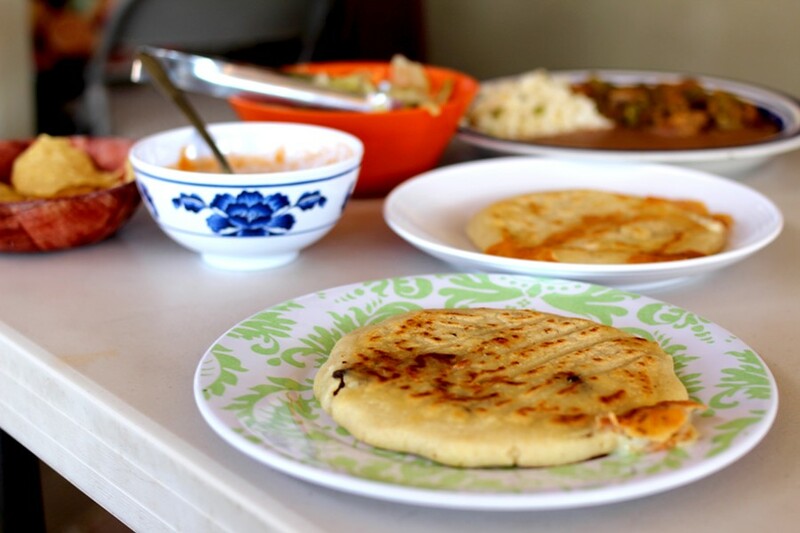 For those uninitiated, pupusas are essentially what happens when you take those thick corn tortillas and stuff them with meats, cheeses and veggies. Think of it somewhere between a fully-enclosed arepa or a masa-shouded empanada. Here, there are several different choices, including pupusas de res, chicharron, frijol and more. Of all of the options, the most unique is the cheese and loroco—a Salvadoran pickled flower, not too different conceptually from cholla buds in Sonora. No matter which you choose, though, you'll be met with a crispy on the outside, chewy on the inside pupusa shell. More adventurous diners will dive into dishes like the sopa de pata ($7), a hearty stew made with cow's feet, tripe, chayote and more. On the maybe more familiar side, tamales ($2.50) and gorditas ($3) are also available with several different filling options. Like the building its housed in, the cuisine of S. Antojitos Salvadoreños isn't flashy, but it is just what it needs to be, resulting in some pretty satisfying eats for weekend breakfast. Hearty dishes will keep you sated while you browse the swap meet—and well throughout the day. Plus. with dishes maxing at $7 for a full meal, you'll not only be able to afford to try quite a bit at this restaurant, but also around the entire market—that is, if you have any room left. So, if you're ready to start exploring all that this Tucson gem in swap meet form has to offer for breakfast and lunch, SAS is a great place to start.